Notre maison est située dans un emplacement idéal. Un calme petite communauté établie donnant sur un magnifique lac encore cinq minutes à pied de la célèbre Wold IMG Bollitieri Tennis & Golf Academy. Un certain nombre d'excellents terrains de golf sont à une courte distance. Avec sa propre piscine chauffée blindé et meublé et maintenu à un niveau élevé, notre maison dispose de la climatisation tout au long de ventilateurs de plafond dans toutes les chambres élégantes, y compris la salle à manger extérieure couverte. Deux grandes chambres de maître chacune avec salle de bains et dressings et une chambre double avec sa propre salle de bains, cuisine entièrement équipée avec bar et coin à manger séparée avec micro-ondes, lave-vaisselle et réfrigérateur-congélateur, buanderie avec lave-linge et sèche-linge, salle à manger formelle et les zones de la famille donnant sur le lac. Le jardin et la piscine chauffée sont entièrement maintenus. Certaines des plus belles plages de la Floride et un restaurants sont à seulement quelques minutes en voiture, et Sarasota culturel et St Cercle Armonds quelque entraînement de 20 min. Absolument parfait! We have stayed in over 20 houses in this area over the years and this house did not let us down. It’s location is perfect, easy reach of all local amenities plus its 10 mins drive to the lovely beaches of Anna Maria Island which we love. 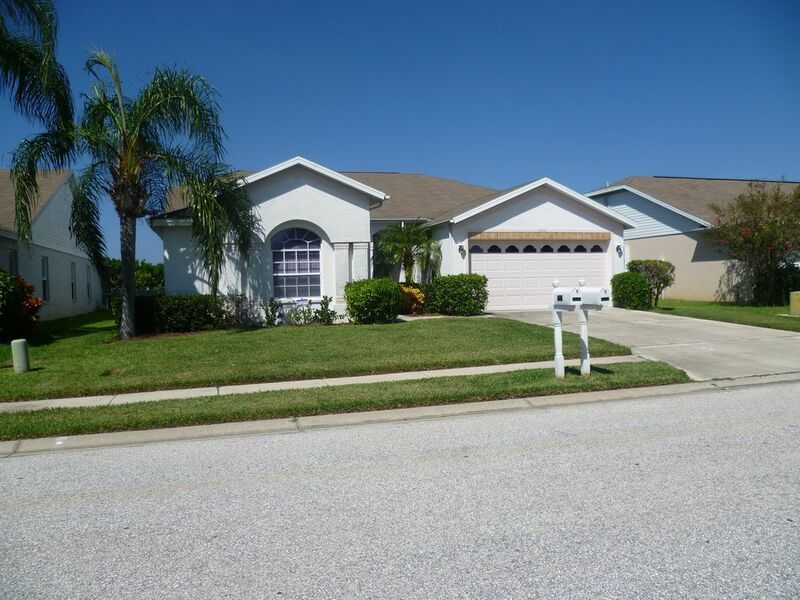 The house is located in very nice place at small lake, in a safe and quiet community and very close to Anna Maria Island and Longboat Key beaches, which are the most beautiful on Florida's west coast of Gulf of Mexico. The entire house incl. the pool is well-maintained, is spacious for a standard family and is very clean. The furniture is well-preserved and the only aged parts what could be replaced are the two sofas in living room (TV area). You will find in the garage everything what you need for enjoyable beach visit i.e. sun umbrellas, beach chairs and some stuff for kids. Supermarkets (Publix, Wallmart etc. ), restaurants (Outback, Applebee's, Bonefish etc.) and all other services you need during your holiday can be reached by car in 2 to 10 minutes. In a range of 15 miles you have a large choice of public golf courses, if you like to play. This house is the perfect place for an active and relaxing holiday, what we really enjoyed this and last year. Excellent Villa in a quiet location. Perfect. We stayed in June 2018. The journey from the airport was around an hour, the driving instructions were excellent even with the small detour to the Walmart en-route. (within a 10min drive of the villa). The villa is in a really nice and quiet location bigger than it looks in the photo's, nicely furnished, very clean with everything provided for. The swimming pool was excellent, incredibly clean. The pool man was lovely and kept the pool perfect for us, he was also very knowledgeable on local activities) If you stay at this villa you will not be disappointed, we had a superb holiday without any problems. We travelled with two youngster 5 and 7 and they loved the freedom of their own pool. The owner of the villa made sure we had everything we needed before our holiday started, excellent communication prior to our arrival and was on hand if we needed any information or advice. would recommend watching a game of baseball Tampa Rays, exploring the beautiful beaches (maybe avoid the beaches at the weekend as it can get very busy), kayaking in search of manatees, sea turtles and dolphins in local sarasota, jumping on the sea screamer in clearwater to see the dolphins jumping in the wash of the boat. All in all a fabulous holiday would definitely recommend this villa. THANK YOU FOR LETTING US STAY. I joined my sister and her husband on the last two weeks of their holiday. This exceptionally large, spacious Villa certainly has the Wow Factor. Each room/area is very tastefully decorated and spotlessly clean and has all the modern facilities you would need for your holiday. The location is perfect for local shops, amenities and stunning beaches. The neighbourhood and setting of this villa is beautiful, very quiet and surrounded by immaculate kept gardens. The outside patio area has a large table/chairs for outside dinning and plenty of sun beds. The pool is a perfect size to laze in and cool off and was always lovely and warm. It overlooks a large lake that has a abundance of wildlife that we enjoyed watching including the amazing sunsets. What a fabulous and welcomed surprise we had when arriving at this villa, after a long and tiring flight from the UK. I can’t say enough about how beautiful this villa and the area it is in. The standard of cleanliness, decoration and it’s contents are first class. Every applicance looks brand new, and everything works. The pool and outside space is so clean and the bbq was well used on warm evenings. The local area is just so quiet, no noisy neighbours here. In fact although people lived there, we hardly saw anyone. Watching all the wildlife on the lake just outside the villa was so relaxing. One of the most important things on a holiday is the comfort of the beds. Well the beds are first class. So very large and comfortable, that I slept the best I ever have in a strange bed. The large fans in all the rooms are fantastic, as the are fully adjustable to the speed they run at. They were a very welcome addition to the air conditioning. This villa surpassed any villa we have stayed in before, and we have rented at least 8 in Florida before staying here. Thank you Debbie for all your correspondence, and I really hope we can come and stay in your fabulous villa again in the future. • Prices include: water, electric, linen, towels and 11% Florida tax • Cleaning after departure : included • A deposit of £100.00 per week of rental is due at the time of booking. Balance required 8 weeks prior to arrival. • Full payment is required if booking is made less than 8 weeks prior to arrival. • A £250 security deposit is required fully refundable after departure providing no damage has been sustained. • Payment accepted in UK Sterling or American Dollars only. • Pool heating is an additional cost of £90 per week (recommended from November through to April ) • Long term rental possible, please ask.